What better way to toast the ending of summer and the change of seasons than with an Endless Summer Dinner Party. 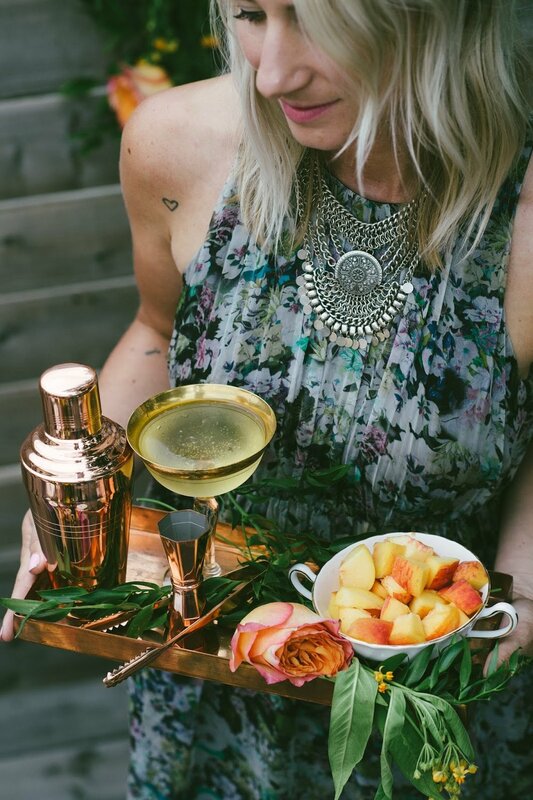 This alternative bachelorette party was an idea sparked by late night conversations with your best girlfriends, sipping great cocktails (in my case usually blue moon beer) and holding on to those last sweeping moments of summer. I am thrilled that the wonderful wedding inspiration website 100 layer cake featured this summer soiree and you can see the whole shoot and read all about our inspiration behind the shoot on their blog! We spent the month planning and creating inspiration boards and calling on all of our favourite creatives in the city to come together for this vision. 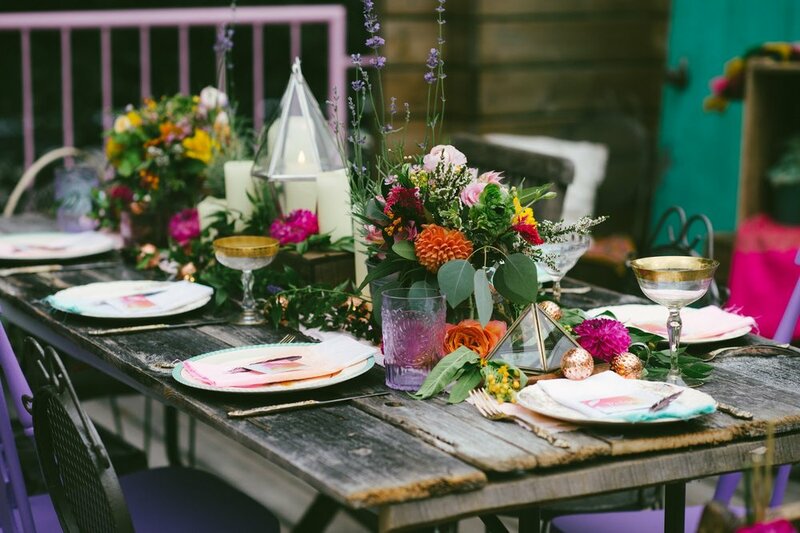 We wanted to create a rooftop oasis that was full of vibrant jewel tone colours, accents of copper, rustic details, healthy and delicious summer foods and endless blooms. We partnered with Lynsey Walker of food blog Lynsey Loves Food to create our menu and boy did she impress! From the colourful crudités board to the shredded brussel sprouts flatbread and the peach bourbon cocktail among other amazing treats, she created the most delicious summer menu for our guests. Scarlet O'Neill photographed the occasion and I cannot wait to share all of her stunning photos! Floral design studio Patchouli stepped in as our floral saviours and created the most amazing bouquets for the centrepiece of the dinner table. They also sent the effervescent Dayna, armed with floral shears to help us create our flower hoop backdrop. She didn't even complain when what seemed like the bee apocalypse joined us on the rooftop and swarmed as we set up the event. I quickly researched the safest way to repel the bees (half parts vinegar and water in a spray bottle) and I am proud to say not one bee was injured in the making of this event. We had graphic design and friend Alex Perlin design our amazing watercolour place cards and menus, she's just the funniest girl with so much talent and part of our girl squad. Alison Sharp, one of my besties and go-to makeup gals made us ladies look pretty for the event, and made me look like a senorita siren and the pretend 'bride' for the evening. BYOB Cocktail Emporium is the badass, one stop shop for all your bar essential needs, provided the glassware for the occasion! Even lending some precious vintage pieces and let me tell you they are stunning!! Alison of Grace Design provided some pretty boho bags for the shoot, along with her glorious Moroccan vintage textiles. Special thanks to Abigail for being our assistant for the day and Paige for being such a beautiful friend with the most amazing design talent and co-creator of the event and a woman that I never stop learning from. How lucky are we to know so many talents in the city who come together in the love of creativity and creation. We spent the night sipping cocktails and eating the best local food with our best friends. We shared stories that inspired and bonded over vulnerable truths easily dispelled through one too many peach bourbons. It is nights like these I cherish, where we use our creativity to create and come together, that we make a night so much more special and that we acknowledge that every moment can be beautiful. Life is about the extraordinary, about being better and doing better and about sharing everything with people you love.